Michael Rowe is a writer for Futurama. 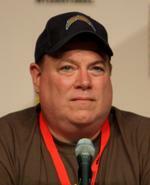 He worked as a writer and producer in season 4, including writing the episode "Bend Her", and joined the show again when it returned for its four films and the second run. During the second run, he was promoted to co-executive producer and has become a more active writer. Outside of Futurama, Michael Rowe has written for Becker, The Nanny and Family Guy. For his work on "Proposition Infinity", he was nominated for an Annie Award. 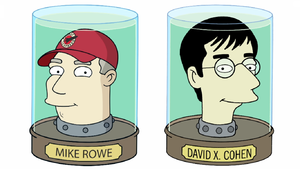 The heads of Mike Rowe and David X. Cohen as seen in the fifth Futurama podcast. This page was last edited on 11 August 2014, at 14:40.